1890s 1/6th plate tintype. Private Collection. Guess who of the four caught my attention? Yes, I got this one for the character to the rear left! He has a threatening look about him, don’t you think? While he most likely upturned his overcoat collar to protect his head from the elements, it makes him look like a classic victorian horror character. With his hands in his pockets and that look of murder in his eyes? Yes, sir, you look badass. By contrast, his friend to the side has a one-sided smile. He has his overcoat collar upturned too but the effect isn’t quite the same, is it? The whole group is in evening wear with bow ties and wing tip collars, and long overcoats. The two in front are wearing gloves, and the ones of the front left sitter are huge! What the heck are those for? The other one’s own gloves look normal size and are tucked in his sleeves. They’re all wearing bowlers of different heights too. It must have been a biting cold day out there (and Mr. Hyde was hanging out at the opera, ha ha!). 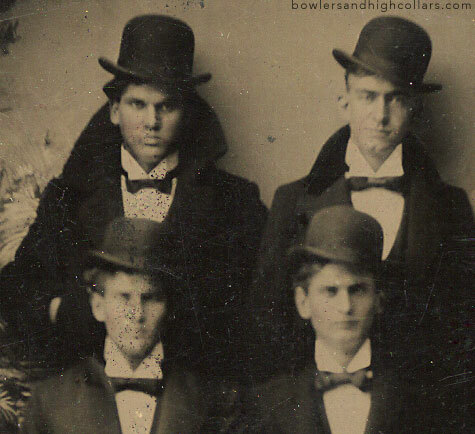 This entry was posted on Wednesday, April 1st, 2015 at 4:24 pm	and tagged with 1890s, bow tie, bowler, evening wear, fashion, gloves, victorian and posted in Bad Boys, Tintypes. You can follow any responses to this entry through the RSS 2.0 feed. What a brilliant tin type. I love your analysis of the characters. This may have been taken out doors as natural light was the cheapest and most reliable way to have good light for the pic. Flash photography was either in its earliest days or not yet invented, depending on the date the photo was taken. Love your blog! Thank you! Love your blog too. You seem very knowledgeable of early types of photography! All from books while trying to get information for some of my blog posts. Did a bit about it in art history at school, too. It is so much fun doing time travelling through photos, isn’t it? But you do have many time machines! Every single photo is one. The research makes a picture come to life, doesn’t it? That is how I see it, anyway. I’m mostly seen as mad and obsessed! I don’t tell everyone I meet I collect old photos. I ease them into it. Haha!